Titanium dioxide (TiO2) is one of the most promising materials for photovoltaics and photocatalysis nowadays. This material appears in different crystalline forms, but the most attractive one for applications is called "anatase". Despite decades of studies on the conversion of the absorbed light into electrical charges in anatase TiO2, the very nature of its fundamental electronic and optical properties was still unknown. EPFL scientists, with national and international partners, have now shed light onto the problem by a combination of cutting-edge steady-state and ultrafast spectroscopic techniques, as well as theoretical calculations. The work is published in Nature Communications. Anatase TiO2 is involved in a wide range of applications, ranging from photovoltaics and photocatalysis to self-cleaning glasses, and water and air purification. All of these are based on the absorption of light and its subsequent conversion into electrical charges. Given its widespread use in various applications, TiO2 has been one of the most studied materials in the twentieth century, both experimentally and theoretically. When light shines on a semiconducting material such as TiO2, it generates either free negative (electrons) and positive (holes) charges or a bound neutral electron-hole pair, called an exciton. Excitons are of great interest because they can transport both energy and charges on a nanoscale level, and form the basis of an entire field of next-generation electronics, called "excitonics". The problem with TiO2 so far is that we have not been able to clearly identify the nature and properties of the physical object that absorbs light and characterize its properties. The group of Majed Chergui at EPFL, along with national and international colleagues, have shed light on this long-standing question by using a combination of cutting-edge experimental methods: steady-state angle-resolved photoemission spectroscopy (ARPES), which maps the energetics of the electrons along the different axis in the solid; spectroscopic ellipsometry, which determines the optical properties of the solid with high accuracy; and ultrafast two-dimensional deep-ultraviolet spectroscopy, used for the first time in the study of materials, along with state-of-the-art first-principles theoretical tools. They discovered that the threshold of the optical absorption spectrum is due to a strongly bound exciton, which exhibits two remarkable novel properties: First, it is confined on a two-dimensional (2D) plane of the three-dimensional lattice of the material. 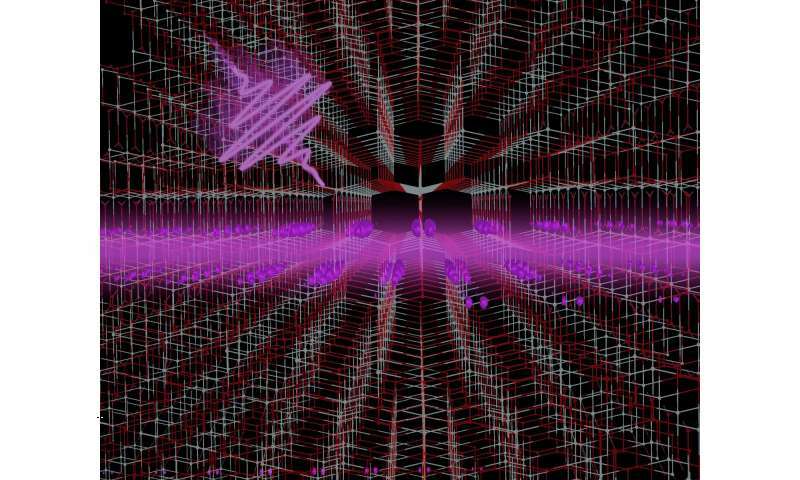 This is the first such case ever reported in condensed matter. And secondly, this 2D exciton is stable at room temperature and robust against defects, as it is present in any type of TiO2—single crystals, thin films, and even nanoparticles used in devices. This "immunity" of the exciton to long-range structural disorder and defects implies that it can store the incoming energy in the form of light and guide it at the nanoscale in a selective way. This promises a huge improvement compared to current technology, in which the absorbed light energy is dissipated as heat to the crystal lattice, making the conventional excitation schemes extremely inefficient. Furthermore, the newly discovered exciton is very sensitive to a variety of external and internal stimuli in the material (temperature, pressure, excess electron density), paving the way to a powerful, accurate and cheap detection scheme for sensors with an optical read-out. "Given that it is cheap and easy to fabricate anatase TiO2 materials, these findings are crucial for many applications and beyond", says Majed Chergui. "To know how electrical charges are generated after light is absorbed is a key ingredient for efficient photocatalysts."